It’s that magical time of the year again! The holiday season is filled with holiday parties and photos, family get-togethers, and seeing people that we may not see as often as we would like, whether that means family that lives far away or old friends that we haven’t connected with in years. With all the holiday festivities coming up, you may be feeling a bit apprehensive about your smile due to discolored or stained teeth. First of all, you’re not alone, many adults experience gradual and noticeable teeth discoloration as the years go by. Just about any food or beverage, such as coffee or wine can be detrimental to the color of your tooth enamel. Yes, tooth discoloration and staining is common, but that does not mean you have to go through the holidays feeling ‘not so merry’ about your smile. At Brandywine Smile Center, we offer restorative dental treatment options to remove tooth staining and discoloration caused by foods, aging, or poor lifestyle habits. Using our professional teeth whitening treatments, combined with a Glen Mills teeth cleaning, our dentists can help you achieve a brighter, cleaner smile that will give you the gift of confidence to smile brightly during the holiday season. When most people notice their teeth starting to lose their bright, white color, their first thought may be to head to the supermarket to pick up tooth whitening toothpaste or over-the-counter whitening products. While these products are typically a convenient and cost-effective teeth whitening alternative, they cannot provide you with the professional results you’re looking for. 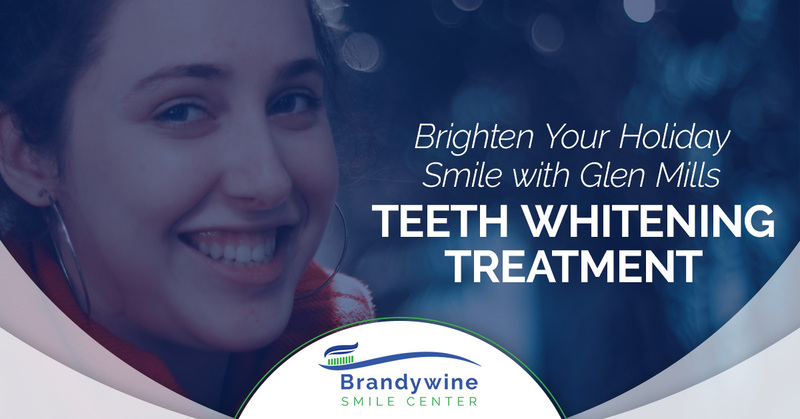 Instead, the Glen Mills dentists at Brandywine Smile Center offer professional teeth whitening treatments that are safe, fast, and most of all, effective. Not only will you enjoy the result, but you also won’t feel apprehensive about showing off your holiday smile that is bright as fresh snow. At Brandywine Smile Center, we offer an in-office teeth whitening treatment to improve your smile with just one visit! We use the KOR Teeth Bleaching treatment, which not only removes stains, it also restores your tooth’s ability to absorb oxygen. This teeth whitening treatment offers benefits that go far beyond over-the-counter options. With this teeth bleaching treatment, you can achieve a bright white smile that you’ll love showing off during all the festivities. If you enjoy the convenience of over-the-counter whitening products, our dental office can provide you with Opalescence Go, at-home teeth whitening trays, which require no impression or customized trays. Instead of scheduling a professional teeth whitening appointment, you can whiten your smile in the comfort of your own home. This at-home treatment is more effective than the trays you’ll find at supermarkets. In just a matter of days, you will achieve professional results that will last. Our at-home options are perfect for those who are too busy for a dental visit or those who just need touch-ups in between teeth whitening treatments. Don’t hide your smile because of dull, discolored teeth. As the holidays approach, give yourself the gift of a brighter, whiter smile with our professional teeth whitening treatments. To schedule an appointment, contact us!